Double Head Diamond Chain Cutting Machine is designed for faceting square and rectangular diamond chains. Equipped with AC motors and Drives, Double Head Diamond Chain Cutting Machine ensures offers efficient performance for longer time, making it worth investing for long run. With our Double Head Diamond Chain Cutting Machine, jewelry makers can design chains in different unique and alluring patterns at low operating cost. 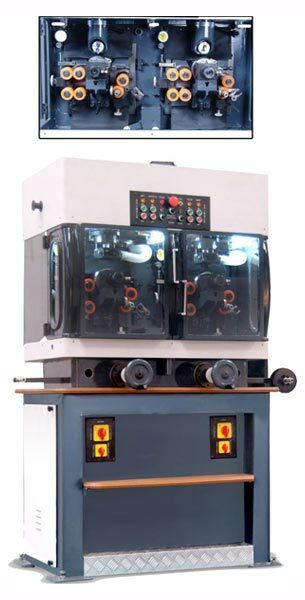 Double head diamond cutting machine for faceting square and rectangular chains. The machine is equipped with AC motors and AC drives to ensure long life maintenance free working. The machine is equipped with high speed spindle capable of generating 23, 000 rpm. All the machine compoents are machined on precision CNC machines and are hardened and grounded. These components are individually inspected for accuracles. The machine is assembled in a controlled environment.